Technical Pro is known to build professional gear that audio professionals and audiophiles turn to for all of their sound needs. Our line of professional receivers is quickly becoming the bench mark for all others to follow. 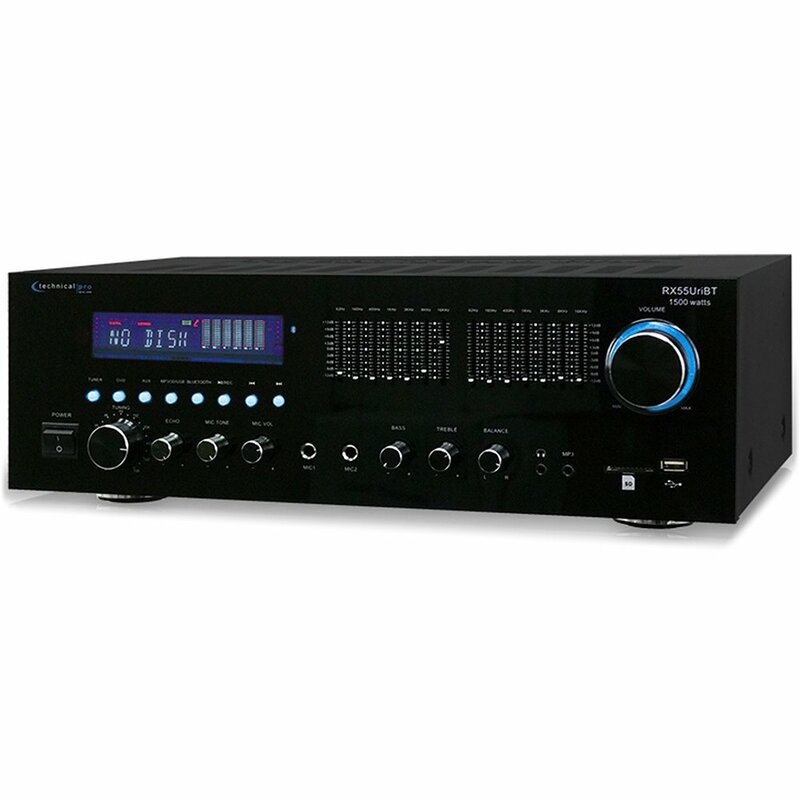 The RX55UriBT Professional Receiver with USB and SD Card Inputs is one of the hottest units on the market. It’s packed with options and of course built with the same long lasting design that you can expect from the engineers at Technical Pro. The RX55UriBT is able to push a total peak power of 1500 watts. This is professional power. In addition to the FM manual tuner there are inputs for 2 RCA, USB flash drive, SD Card and AUX (1/8") connections. Connect such sources as a CD player, DVD player audio, mixer or other stereo audio devices. The USB flash drive and SD Card can handle a maximum size of 32 GB & play your .mp3, .wav & .wma files from your USB flash drive or SD Card through this receiver. Playback features for the USB flash drive / SD Card inputs include play, repeat and random playback. Forgot your USB flash drive at home? Want to play audio files from your phone while keeping it safe in your pocket? No problem. The RX55UriBT's Bluetooth compatibility allows for wireless connection to any A2DP stereo Bluetooth device. That means you can play audio files from your phone, laptop or any other Bluetooth enabled device within a 30 foot foot range. The RX55UriBT gives you the freedom to stream music wirelessly from any Bluetooth enabled device. The RX55UriBT has a built in Dual 7 Band Equalizer. This is instrumental if you want to properly adjust your frequencies for optimal performance in any room or venue. The front panel shows a digital fluorescent output display that shows the audio source, ID3 tags, and track and title information for the USB / SD Card inputs. One quick look to the face of this unit and you know all the information you need about your playback status. Also included are additional bass, treble and balance controls. Use the included remote control for ease of use. Set up your sound sources, walk away and control all your features from the remote. One look at the RX55UriBT and you will think it arrived from the future. The unit is extremely stylish and will surely impress your clients or your crowd. If you are serious about your sound, and are in need options to play modern audio sources, and want to maintain a high level of performance this is for you…and it’s available at a price that won’t break the bank.